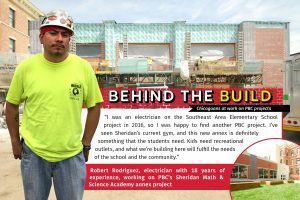 Chicago resident and experienced electrician Robert Rodriguez has worked on both Southeast Area Elementary School and the Sheridan Math & Science Academy annex project. Opportunities are advertised in the local newspapers as well as being posted on the PBC website. Firms interested in working with the PBC are encouraged to sign up for PBC Alerts, a free service that notifies via email you each time contracts are offered for bid or professional qualifications are sought. The Public Building Commission may issue a Request for Qualifications (RFQ) for specialty consultants, such as surveyors, environmental consultants, commissioning agents, and specialists in construction materials testing and inspection. As projects are approved, the PBC will solicit proposal(s) from the pool of prequalified specialty consultants. Task orders are issued against specialty consultant term contracts.